While looking to add two buttons to an enhanced version of the board, an error was spotted which put the Vcc on the wrong pin when connected to an Arduino Micro Pro. 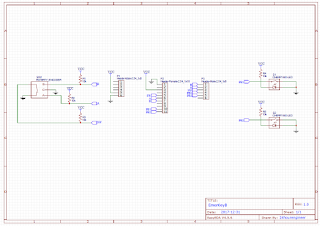 This had to be corrected in the schematics and layout. Fortunately, no boards had been ordered. 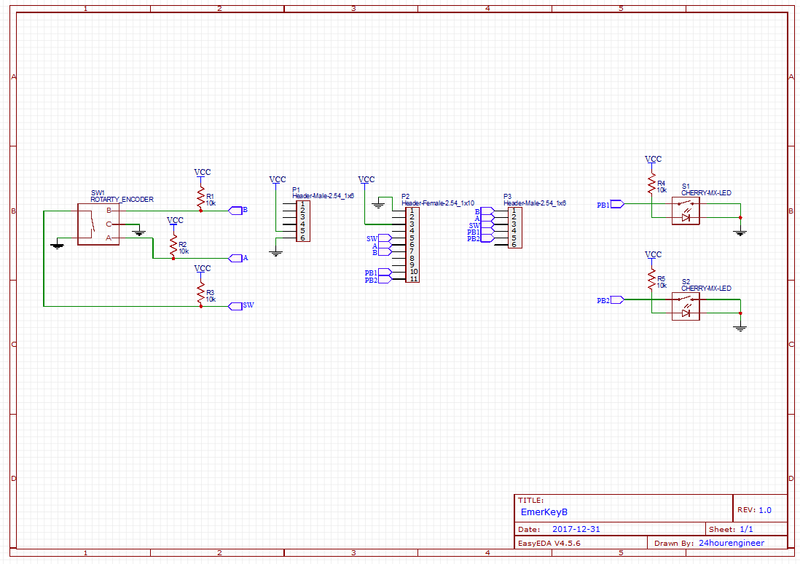 Two pushbuttons were added to the schematic. These were drawn on the right side. Headers for the Arduino Micro Pro were extended to reach the bottom of the board since the switches would easily extend beyond that anyway. The layout was considered for a long time. Aesthetically, placing a button on each side of the encoder would look nice and give it balance, but from the standpoint of operating, it made more sense to allow one hand to operate the buttons while the other hand controlled the encoder. Both buttons were placed in parallel to the length of the Arduino Pro Micro. The pushbuttons were placed 19.05mm apart, a standard for keyboard buttons, which is what will be used. Keeping the standard distance should also allow keycaps to be added without interference. The board was routed using the local routing option mentioned previously. When everything was completed, the board was rendered as it should look after production. Top and bottom views have been captured below.